If you are about to become a Canadian Citizen, do benefit from the YMCA program so YMCA is arranging a Citizen Support Group and the program starts next week on Tuesday 04-September, 2018. For more details, please see the flyer in the lobby. The International School of Cambridge is starting it's next session on Tuesday 04-September, 2018 and Registrations are continuing at the International School of Cambridge (ISOC) for 2018-19. The School focuses on strong academics & leadership skills, while developing a growth mindset among it's students so your children are groomed to be responsible and fully functioning members of the society through an education that encompasses provincial curriculum as well as the knowledge & understanding of Quran and Sunnah. Sunday School registration has begun and registration fees are discounted before 01-September, 2018. Please contact the office or email at (sundayschool@iccambridge.com) and classes will begin on Sunday 09-September, 2018. Thanks for bringing the Qurbani Meat so we are still accepting the meat in small packs with labels (Lamb, Goat, Beef etc.) from Monday through Friday (27-August to 31-August) between 9:00 AM to 2:30 PM. The ICC Summer Camp | Second Session has started from Tuesday 31-July, 2018 from 9:00 AM – 2:00 PM. Registrations are continuing at the International School of Cambridge (ISOC) for 2018-19. Canadian Council of Muslim Women (CCMW), Waterloo Wellington Chapter is organizing an exciting Family Picnic on Sunday 12-August, 2018 at Waterloo Park from 1:00 PM to 8:00 PM. 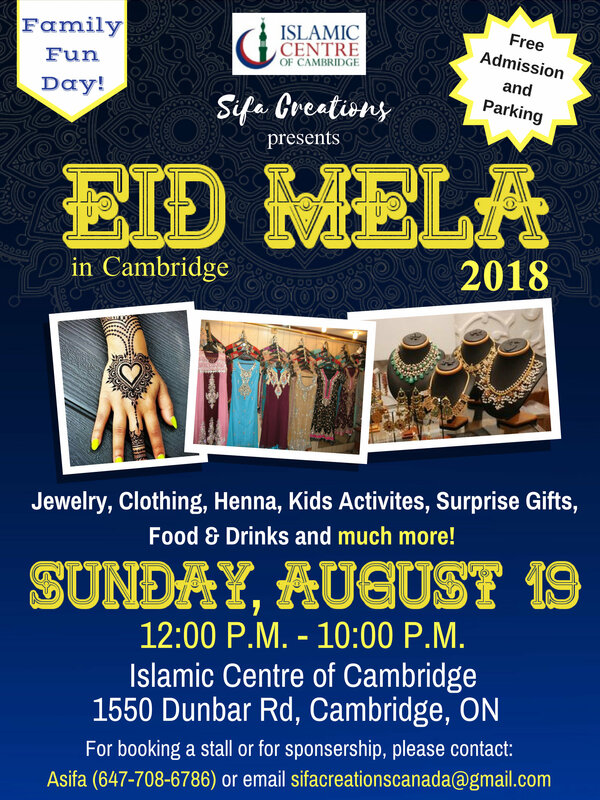 Mark your calendars for the upcoming Eid Mela at ICC on Sunday 19-August, 2018. According to Fiqh Council of North America, Eid-ul-Adha will fall on Tuesday 21-August, 2018 and the Day of Arafah will be on Monday 20-August, 2018. Eid Prayer Times and other details will be confirmed over the weekend. Many parents of ICC and ISOC students want to have ride-sharing facility for pickup & drop-off of their kids so any parent who is interested in providing or taking advantage of such service is requested to give their details in the office and ICC will facilitate in connecting such interested parties. There is an exhibition in the parking lot of ICC, the cash collected as a result of the sale will be used by KWMO. KW Mothers of Orphans (KWMO) is a group and workshop of women in the Kitchener-Waterloo area working on a charity project sewing clothes for Eid-ul-Adha 2018 made especially for Orphans to be sent to Baghdad, Iraq. Our city government is surveying the community's wellbeing, regarding what works and what aspects need to be improved so they are interested in hearing from under-represented groups, including Muslims then please invest 30 minutes to complete this survey. Kindly visit the Waterloo Region Survey and the wellbeing survey is voluntary & anonymous.